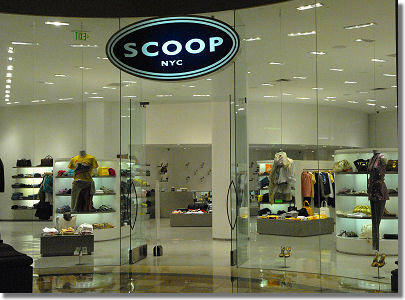 In an exclusive interview with WWD, Scoop NYC president and CEO Susan Davidson said that the company is aggressively moving forward with a number of new store openings in various cities, including Boston. Apparently the company is “close to signing a lease” on Newbury Street. Very interesting. And about time really. One can’t help but wonder how this will affect sales at Intermix, the only real multi-brand boutique competition (not counting Saks) on the shopping thoroughfare. Though, with its recent amping up of looks and labels, local love The Tannery will go head-to-head with the New York City import. There will likely be some overlap with Dress too, but Jane and Martha keep a much lower profile. Anyone want to venture a guess as to its targeted location? There are plenty of empty spots. I see it doing something slightly spiffy, between Berkeley and Dartmouth, though it could easily go with a lower rent in a decent space between Fairfield and Gloucester. I suppose it could also join the ranks of Madewell and 344 on the last block of Newbury, though the prices are slightly upscale for that end of the street. Subscribe for |style carrot • boston | updates.